So, yeah, about this book. No title as of right now, it’s true, but still much to tell you about. One of the major themes in the new book is singing. The story tells the tale of three generations of one family, and everyone sings. 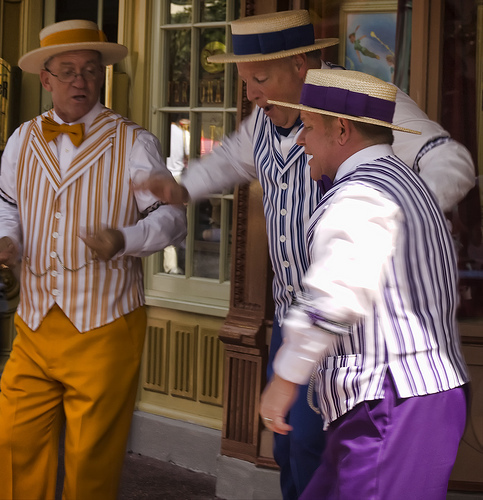 In particular, there are four brothers who sing unaccompanied barbershop harmony together. Over the past few years I have learned a lot about barbershop singing. We authors like to call it, ahem, research. I have listened to CDs, watched countless videos on You Tube, and surfed the web until all that glorious harmony nearly made my ears fall off. I’ve read a lot of books – some academic musicology tomes which are dry beyond belief, and some self-published nonsense which is so full of mawkish, gushy enthusiasm (and exclamation marks!!) that I could hardly stand to read them. Oh, muse, the things I do for you. If you immediately think of old white guys dressed up in silly outfits, you’re pretty much on the mark. It’s fair to say that sometimes these folks don’t do themselves any favors. There is, let’s be honest here, much to mock. Zadie Smith wrote a fantastically funny bit in her novel On Beauty about the awfulness of glee clubs and close harmony singing – what was so hilarious was that she never said why it was all so toe-curlingly terrible; it was just taken for granted. It turns out that there is a great deal to relish in all this. The tunes are often wonderful – even if the lyrics can be a bit syrupy. The musicianship needed to pull off some of the flashier tricks is eye-popping. And the passion with which barbershoppers pursue their hobby is inspiring. (After all, you have to be really enthusiastic about something to dress up like that in public.) There is an admirable sense of tradition and history that drives a lot of what they do. Rather to my surprise, I have developed a real affection for the whole business. More on this in future posts. In the meantime, here’s a video of the most recent winners of the Barbershop Harmony Society’s international quartet competition, Storm Front. Yes, I know, shiny purple suits. But this is terrific stuff. And, you’ll note, they don’t take themselves too seriously. What’s not to like? Sorry Alex, you’re a great guy and everything but that is awful. If music like this vanished from the face of the earth I would be very happy. In spite of this, I really am looking forward to the book!!!! Oh, Chris. And you a musician, too! Well, I love a challenge. I wonder if I can make you see the light. I’ve got more than a year until the book is published… are you willing to be persuaded ?! ?